William Lambers is the author of "Ending World Hunger" and the "Road to Peace." He is a blogger with the Huffington Post. The U.S. military took part in a special mission during the holidays of 1953. It was called "Operation Reindeer." CARE packages of food were delivered to the hungry in countries still recovering from World War II. It was as if Santa Claus packed his sleigh with enough food to feed the world. After Operation Reindeer had ended, someone asked why isn't such a great initiative made year round. The U.S. government listened. They started the Food for Peace program, which has fed the world’s hungry ever since. One reporter remarked they fired Santa and then gave him a year round job. Food for Peace, signed into law by President Dwight Eisenhower, donates food to countries in need. It is the largest single donor to the UN World Food Programme, which is the lead agency fighting hunger. Food for Peace also donates to charities like Catholic Relief Services and Save the Children, who then distribute the aid in developing countries. Last year when Typhoon Haiyan struck the Philippines, it was Food for Peace that sent emergency rations to feed storm victims. Cash was also sent to allow aid agencies to buy rice locally for storm relief. In Providence, Rhode Island, Food for Peace donations support the life-saving work of Edesia. The peanut paste Plumpy'Nut is produced by Edesia and distributed abroad to feed malnourished children. Lack of food for a small child can cause lasting physical and mental damage, or death. Edesia's foods have fed children in Syria, where malnutrition is the other enemy facing that war-torn nation. So much more needs to be done to combat hunger. We need a stronger Food for Peace plan to keep pace with world events. Just look at what's happening. There are 805 million people who suffer from hunger. There are more refugees now, than any time since World War II. They are hungry and have lost everything. The World Food Programme (WFP) is trying to feed over seven million war victims in Syria, but they are struggling to raise funds. But that's not the only emergency in the Middle East. The onslaught of ISIS has put millions more at risk of hunger in Iraq. Yemen, a country victimized by Al Qaeda, has high rates of hunger and poverty. A hunger crisis is fast developing in the Ukraine too. Wars in South Sudan and Central African Republic will put those two nations at risk of famine in 2015. The Ebola crisis in West Africa is also a hunger crisis. WFP is planning to feed over one million people there. In the Democratic Republic of the Congo, the Food for Peace program supports emergency school feeding. This helps children victimized by war to get a good meal and an education. But more funding is needed to reach who are not able to receive school meals because of low funding. Many children count on school meals as their only source of food for the day. As we head into 2015, our foreign policy as a nation must be centered around Food for Peace. The program needs more funding with the emergencies that are ongoing. 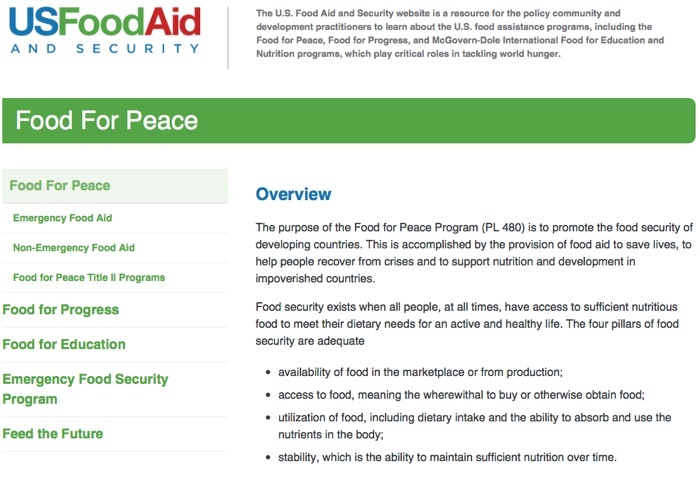 Food for Peace’s budget is currently around 1.5 billion a year. Compare that to nuclear weapons annual spending, which one estimate has at around 52 billion a year, you see that feeding the hungry is a relatively small expense. Food is about goodwill and hope for the world. For so many hungry people, those things are absent. And we cannot build a world of peace on empty stomachs and hopelessness. So this holiday season you can donate to feed the hungry, both at home and abroad. But also think of the year ahead. Let's remember that Santa now works year round feeding the hungry. He is looking for volunteers to help him on this Food for Peace quest. When can you start?